Ok here is a fun recipe for you. I saw it on a cooking show and tried it, and I have to say yummo. I made some and gave it to friends and they all loved it. The photo is from the batch I made. Put butter, peanut butter, icing/confectioners’ sugar and cocoa into a bowl of an electric mixer and beat on medium, using paddle attachment for 10 minutes or until very light. Fold in peanuts. Spoon mixture into paper cake cases, make it uneven lumps. Refrigerate for about an hour until firm. Put chocolate in a large heatproof bowl over a saucepan of simmering water, make sure bowl doesn’t touch water (or melt in microwave). Remove from heat and whisk in copha. 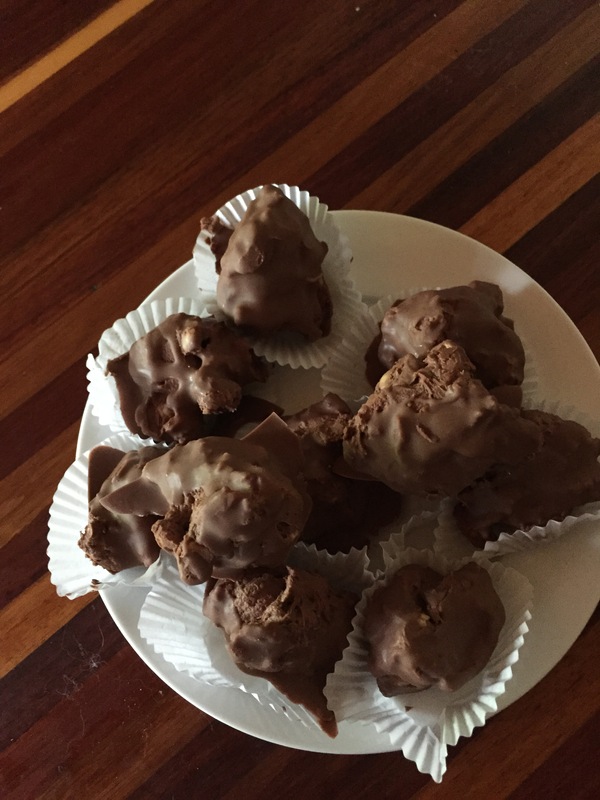 Either dip peanut chunks into chocolate or pour some over them and return to refrigerator and chill. Dust with extra cocoa if you would like. I keep them in the fridge otherwise they go soft. Ch’kara, I know they’ll giggle over the name. I look forward to making it with them. They love to get in the kitchen and cook with me. Thanks for the recipe.